"In an article entitled Woman’s Conquest of Music, published in 1902, Henry T. Finck, states: 'In all languages, so far as I know, music is of the feminine gender…In modern Japan, as in Oriental countries in general, and as among the ancient Greeks and Romans, we find art-music almost entirely in the hands of women'. As positive a start as that was to an article featuring a large portrait of pianist Fanny Bloomfield Zeisler, Finck quickly falls prey to the sentiments of his day, writing: 'A woman pianist is in constant danger of becoming an amazon—a bogus man—and as such to lose half her charm. It is a queer but undeniable fact that the average female pianist is more muscular and less capable of tender expression at the keyboard than the average male pianist'. Although the article was written some one hundred years ago, the women featured on this anthology all, at some time in their careers, fell prey to chauvinistic views directed at them by male critics. 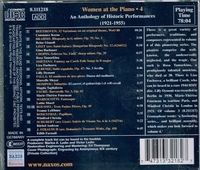 In the first fifty years of the twentieth century over two hundred women pianists left recorded evidence of their artistry. In the fourth volume of this continuing series celebrating women pianists, we present sixteen more extraordinary performers. New York born Constance Keene (1921-2005) studied at the Walden School and Dalton School. Her piano teachers included Kathryn Makin, Lotte Hough, and Abram Chasins (who became her husband in 1949). She also studied chamber music with Gregor Piatigorsky. Her début as a Naumburg Award-winner was at Town Hall, New York, on 8 November 1943. Her long and distinguished career included teaching and concertizing, as well as recording the complete Rachmaninov Preludes and works for two pianos with Chasins. Among her earliest recordings is this performance of Beethoven’s 32 Variations on an original theme in C minor, WoO 80 (1806)  which was issued on a Mercury LP in 1952. French pianist Reine Gianoli (1915–1979) was a child prodigy. Among her teachers were Yves Nat, Alfred Cortot and Edwin Fischer. According to George Kehler, 'it was Yves Nat who sustained and expanded her musical interests, while Alfred Cortot not only directed her instinct toward the world of the great romantics, but conducted the orchestra in her concert début when she was seventeen'. Gianoli eventually taught at Cortot’s conservatory (1946–1965). It was Edwin Fischer, perhaps, who had the most impact on Gianoli. She also collaborated with Fischer in many concerts that featured concertos for two or more pianos. Her distinguished career included performances under the batons of Weingartner, Monteux, Boult, Cluytens, Keilberth, Schuricht and others. The Brahms Rhapsody in G minor, Op 79, No 2 (1879)  included here was recorded in 1947 clearly shows Fischer’s musical influence. Gina Bachauer (1910–1976) was born in Athens to an Austrian father and an Italian mother. Her early studies were at the Athens Conservatory with Waldemar Freeman, and later at the Ecole Normale de Musique with Alfred Cortot. In Paris Bachauer also studied briefly with Rachmaninov. She made her professional début in 1935 with the Athens National Symphony Orchestra. After WWII, Bachauer’s career restarted in London at the Royal Albert Hall under the baton of Alec Sherman, who became her second husband. Her spectacular technique was praised by critics and audiences world-wide, and among her earliest recordings in England was this 1949 performance of Saint-Saëns’ edition of Liszt’s Hungarian Rhapsody No 12 in C sharp minor (S244/12 and R106/12) (1853) . In the Great Hall of the Moscow Conservatory, in October 1949, a very special concert took place in honour of the centenary of Chopin’s birth. Chopin’s Second Piano Concerto was performed by Rosa Tamarkina (1920–1950)—it was also Tamarkina’s last public appearance for she was to die from cancer in August 1950. Tamarkina was a student of Alexander Goldenweiser and Konstantin Igumnov at the Moscow Conservatory, graduating in 1940. In 1937, the seventeen-year old pianist participated in the Chopin International Piano Competition in Warsaw, winning the second prize, to Yakov Zak’s first prize. In 1946 Tamarkina began teaching at the Moscow Conservatory, about the same time she was diagnosed with cancer. The painful treatments made performing and recording difficult. Luckily she left an eclectic and powerful recorded legacy, that included works by Rachmaninov, Taneyev, Brahms, Liszt, and, of course, Chopin. Her visceral interpretation of Chopin’s Scherzo No 3 in C sharp minor, Op 39 (1839) , recorded in 1947, is a testament of how great a pianist she was. Liza Fuchsova was born in Brno on 31 March 1913. A precocious child, she began piano studies at the age of three and at ten years of age performed with the Czech Philharmonic Orchestra in Prague. Upon graduating from the Prague Conservatory she joined the faculty, teaching there until 1939, when she emigrated to England. She was active as teacher, soloist and chamber musician in England, performing with the Dumka Trio and in duo-piano programmes with the pianist Paul Hamburger. In February 1977 Fuchsova died in London. Although she championed many British composers (Montague Phillips, Walter Thomas Gaze Cooper, and Humphey Searle, to name a few), it is as a lifelong champion of the music of Czech composers that she is best remembered today. Her heartfelt interpretation of Smetana’s rarely heard Fantasy on Czech Folk Songs (Fantasie na ceské národní písne) in B major (1862)  was recorded in London in 1944 and was the first recording of this work to appear on disc. Lilly Dymont was born into a musical family on 12 July 1911, in Berlin. Her father, Jakob Dymont (1881–1956) was an esteemed choirmaster, conductor and composer of Jewish liturgical music. Lilly began studies first with her father. Later her primary teacher was eminent Berlin pedagogue Georg Bertram (1882–1941). By her early teens, Lilly Dymont had performed with many prominent European orchestras and under the batons of Leo Blech, Paul van Kempen and William Steinberg. She began recording for Polydor in 1928. After an interview with the Gestapo in 1937, Lilly Dymont made a life-changing decision. She visited the American Embassy in Berlin and contacted a friend in New Hampshire, who arranged a visa for her and her family. In 1938 she moved to the United States, settling in New Bedford, Massachusetts, with her husband Dr Walter V. Mindus. She also changed the spelling of her name to Lily Dumont. As teacher, for over forty years, she was on the faculty of the Longy School of Music in Cambridge. She was founder and longtime president of the New Bedford concert series, and for many years she organized an annual summer seminar for pianists at the University of Massachusetts at Dartmouth. Lily Dumont died on 6 March 2006, at the age of 94. Her recorded legacy includes the early Polydor discs, with the very first recording of Chopin’s Bolero, several recordings for HMV and several early LPs on the Concert Hall Society label. Playing a Bechstein concert grand in 1930 in the Polydor Berlin studios, she gives a vivacious and stylish interpretation of Albéniz’s Sevilla, from Suite española, Op, 47 (1886) . Extraordinary French pianist Marcelle Meyer, was born in Lille on 22 May 1897. She began studies with her older sister, Germaine, and in 1911 entered the Paris Conservatoire, where she studied with Marguerite Long and Alfred Cortot. Her marriage to actor Pierre Bertin introduced her to Satie’s circle. She met all the great artistic personalities in Paris at the time, including Debussy, Poulenc, Milhaud, Durey, Auric, Ravel, Stravinsky, Diaghilev, and Monteux. By the 1920s she had performed with many of the most illustrious conductors in Europe, including Mengelberg, Beecham, Ansermet, Boult, and Richard Strauss. Her marriage to Italian lawyer Carlo Di Vieto in 1937 led to her becoming friends with Dallapiccola, Rieti, Casella, and Petrassi. Through the 1950s she performed with Munch, Scherchen, Kletzki, and Karajan. On 17 November 1958, Marcelle Meyer died suddenly at the piano while staying at her sister’s apartment. A natural and fluid pianist, she left an extensive legacy of recordings. Her remarkable recordings included works of Bach, Scarlatti, Couperin, Rameau, Chabrier, Debussy, Ravel, Mozart, Schubert and Stravinsky. Her friendship with José Iturbi opened a world of Spanish music, which she performed throughout her life. Falla’s Danza del molinero (Farruca), from El sombrero de tres picos (1917) , recorded on 1 December 1925, in London, shows her exceptional interpretative skill in capturing the deep spirit of the music. Magda Tagliaferro was born Magdalena Maria Yvonne Tagliafero to French parents in Petropilis, Brazil, on 19 January 1893. Her father, who studied with Raoul Pugno, was her first teacher. He was professor of singing and piano at São Paulo Conservatory. A chance encounter with Pablo Casals led her to move to France, where she enrolled at the Paris Conservatoire. She studied there with Antoine Marmontel and Alfred Cortot. Cortot proved to be a very important influence on the young Tagliaferro. She toured with Gabriel Fauré and performed with Edouard Risler. She championed many composers whom she met, including d’Indy, Fauré, Ravel, Poulenc, and Hahn. Her compatriot, Heitor Villa-Lobos, was her lifelong friend and her recordings of his music remain the yardstick by which all other interpretations are measured. After World War II she divided her time between Brazil and France. A passionate and forceful performer, she was a striking sight on stage, with deep-red hair. Her repertoire was extensive and wide. Her recording career spanned from 1928 to 1981 (and her early concert programmes and recordings spell her name with one “r”). She continued performing into her nineties. Tagliaferro died in Rio de Janeiro on 9 September 1986. Recorded in Paris, on 26 March 1930, Federico Mompou’s La Rue, Le Guitariste et le Vieux Cheval (El carrer, el guitarrista i el vell cavall) from Suburbis (1916–17)  shows her ability to evoke clarity and tenderness, while imbuing Mompou’s work with a heady passion. French pianist Marie-Thérèse Fourneau was born in 1927. She studied at the Paris Conservatoire with Marguerite Long, Joseph Calvet and Jean Doyen, graduating with the Premier Prix de Piano in 1942. In 1943 she received second place to Samson François’s first prize at the International Marguerite Long-Jacques Thibaud Competition. In 1946 she won first prize at the Concours international de virtuosité de Genève. In 1947, she received a Grand prix du Disque. Her brilliant international career was cut short by multiple sclerosis. She died at the Hospital de Saint-Mandé (in Val-de-Marne, France) at the age of 73 on 11 May 2000. Celebrated for her performances of the music of Debussy, Ravel and Fauré, she is heard on this anthology in a caressing interpretation of Fauré’s Barcarolle No 3 in G flat major, Op 42 (1885)  which she recorded in Paris, on 21 April 1944. Swiss pianist Lottie Morel was born on 24 July 1909, in Geneva (her maiden name was Huguenin). She studied at the Conservatoire de Musique de Genéve. Her teachers included Johnny Aubert (1888–1954) and Alexandre Mottu (1883–1943) (piano), Charles Chaix (harmony), and William Montillet (organ). Upon graduation she began a long and distinguished career as a professor of piano at the Conservatoire. She concertized extensively both as soloist and chamber musician (often appearing in concert with Hugues Cuénod, Charles Panzéra, and Pierre Fournier, among others). Throughout her career she championed contemporary music, and in particular Swiss composers. She is closely identified with two composers—Henri Gagnebin, (1886–1977) and André-François Marescotti (1902–1995), whose concertos and solo works were often featured on her programmes. Lottie Morel died on 25 January 1973, of an embolism, in Bordighera, Italy. She recorded for London/Decca Marescotti’s Piano Concerto as well as his cheerful and capricious Fantasque (1939) . French pianist, Yvonne Lefébure was born in Ermont on 29 June 1898. A prodigy, Lefébure studied with Maurice Emmanuel and Charles-Marie Widor at the Paris Conservatoire and also took private lessons with Alfred Cortot. Lefébure maintained a lifelong concert schedule and was a favourite of conductors such as Igor Markevitch, Sir Adrian Boult, and in particular Pablo Casals, who regularly invited her to his Prades and Perpignan festivals of the 1950s and 1960s. She was appointed teacher at the Paris Conservatoire in 1952. In January 1960 she received, along with Vlado Perlemuter, a fellow Cortot student, the Croix de la Légion d’Honneur. In 1964 she founded the ‘Juillet musical de Saint-Germain-en-Laye’, and in 1968, the Debussy Competition. She resigned from the Conservatoire in 1967. Deeply affected by the death of Freddy Goldbeck in 1979, she retired from the concert stage. She died in Paris on 23 January 1986, at the age of 87. Among her pupils were Samson François, Dinu Lipatti, Evelyne Crochet, and Imogen Cooper. Although she was acclaimed for her performances of Mozart, Bach and Beethoven, this recording made in Paris on 20 June 1949, of Roussel’s Trois Petites Pièces, Op 49 (1933) [–] shows her at her very best in French repertoire. Winifred Christie was born in Stirling, Scotland on 26 February 1882. She studied at the Royal Academy of Music in London, on a Liszt Scholarship and with Oscar Beringer (a pupil of Tausig). After graduation she studied abroad, especially with Harold Bauer. She lived in the United States (1915–1919). In 1923 she married the composer and inventor Emanuel Moór (1863–1931). He designed what became the Bechstein-Moór Duplex Grand Piano, a double keyboard instrument (164 keys on two keyboards, which allowed the playing of spreads of over two octaves with a single hand) that Christie toured almost exclusively until 1939 with music adapted by Moór to exploit its possibilities. After the war she founded the Central Music Library as well as a scholarship at the Royal Academy (of which she was a Fellow) especially to revive interest in the Moór-Duplex piano. She was also a composer of concertos, chamber music and solo piano works. She died in London on 8 February 1965. This recording of Moritz Rosenthal’s Papillons (1897)  was made in London in 1921 and pre-dates the composer’s own recordings of the work (piano roll and 78rpm). Bärbel Andreae was born in Berlin on 13 July 1909. She was born into an affluent and politically connected family—she was the niece of Walther Rathenau (1867–1922), a German Jewish industrialist, politician, writer, and statesman who served as the Foreign Minister of Germany during the Weimar Republic. Andreae graduated from the Hochschule für Musik in Berlin. In 1939 she moved permanently to Zürich where she performed and taught. After the war, she concertized in Germany, performing with the Berlin Philharmonic and the orchestras in Dresden and Munich. Bärbel Andreae was celebrated for her exceptional and sensitive performances of Mozart and Schubert. Equally important was her dedication to contemporary piano literature and her championing the works of René Armbruster, Max Kuhn, Paul Müller-Zürich, Othmar Schoeck and Wladimir Vogel. Andreae died in Zürich on 25 January 1996. Her 1929 Berlin recording of the Schubert/Liszt Soirée de Vienne No 6 in A (S.427/6 and R252/6) (1852)  was the first on record, preceding by a few years the celebrated early recordings by Petri and Rehberg. Hungarian pianist Edith Farnadi was born in Budapest on 25 September 1921. She began her studies at the age of seven with her mother, and afterwards at the Franz Liszt Academy of Music, where her teachers included Arnold Székely, Leó Weiner, Béla Bartók, and Zoltán Kodály. At the age of nine she made her musical début as a child prodigy. At the age of twelve she played Beethoven’s First Piano Concerto, directing the orchestra from the piano. She received her diploma from the Musical Academy in Budapest when she was seventeen years old. During her studies at the Music Academy she won the Franz Liszt Prize twice. She became a professor at the Budapest Franz Liszt Academy where she remained until 1942. From 1945 she lived in Vienna, concertized widely throughout Europe in the 1950s, and made numerous recordings for the Westminster label. Besides her concert activities, she also conducted the masterclass at the Graz Academy of Music in Austria. She died in Vienna on 15 December 1973. Her stylish and technically effortless interpretation of Dohnányi’s 1928 transcription of Strauss’s Schatz Waltz (Treasure Waltz), Op 418  was recorded at Westminster’s London studios in June 1955."